Latest version : package file with modified date : 03/30/2018 6:41 PM. Please make sure you have the latest version. Every plugin is not independent mod package, unless it is said so. You have to install the main package if you want to use a plugin. What does this mod do ? Basically, this mod does counting and reminding of relationship anniversary by months basis. Please note : the term "a month" refers to "a quadrant" or "a season"
Whenever a sim starts going steady, being engaged or getting married, the counting starts from 0. Whenever a sim is no longer steady, engaged or married the counting resets and stops. Being enganged after going steady does not reset the counter though. By default, every month on the same date as relationship began, the counter increase by 1 and notification will show up as reminder. Whether you want to celebrate the anniversary or not is up to you. This can be adjusted by using SimPE as shown in pic 3. You can make the anniversary is every two months or every three months instead of every months by modified the tuning parameter using SimPE. Jack proposed Jane on "2 days left in Winter" (which is Day 3 of Month 3 if the seasons order is Summer-Fall-Winter-Spring and days per seasons is the default 5 days). So, on the next "2 days left in Spring", Jack and Jane will have their first anniversary, and in "2 days left in Summer" they will have their second anniversary and so on. Let say, on "1 day left in Summer", Jack is married to Jane, so there is no more anniversary on "2 days left in Autumn" but they'll have first wedding anniversary on "1 day left in Autumn" instead. If you use seasons or quadrant length mod where the length of every season or quadrant is different, if the current season's length is less than the date of relationship begins, anniversary will occurs on the last day of the seasons. and the neighborhood has seasons order : Summer-Fall-Winter-Spring. On the "2 days left in Summer" (which is day 5 of Summer), Jack is married to Jane. So their first anniversary will be on "1 day left in Autumn" (day 4 of autumn), since there is no day 5 in Autumn. 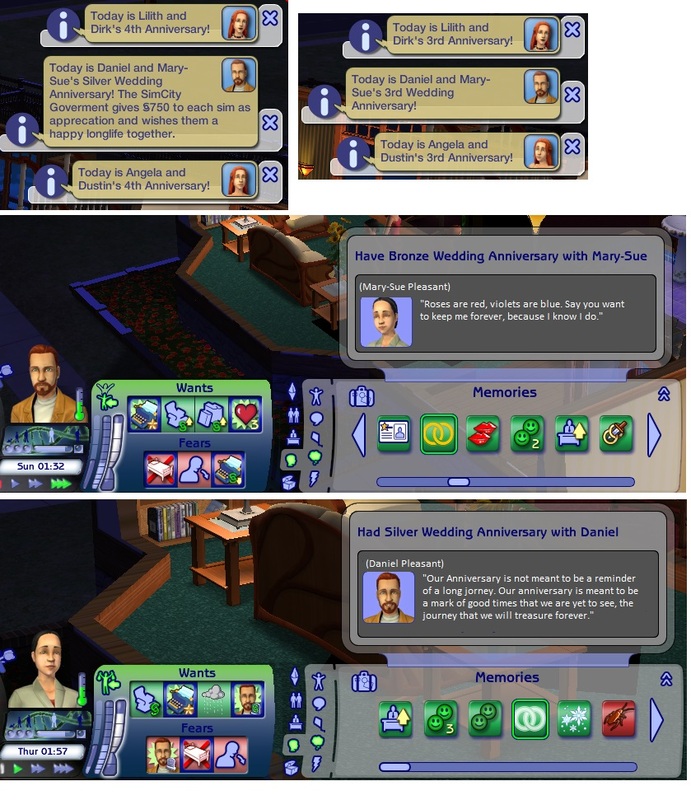 By default, if the sims are married, they can have bronze wedding anniversary (2nd anniversary), silver wedding anniversary (4th anniversary), golden wedding anniversary (6th anniversary) and platinum wedding anniversary (7th anniversary). On these days, they will receive special notification and money as appreciation gift. This can be adjusted by using SimPE as shown in pic 3. If partner sync is ON, the money gift on anniversary will still be given to partner sims even if they are not member of active household. 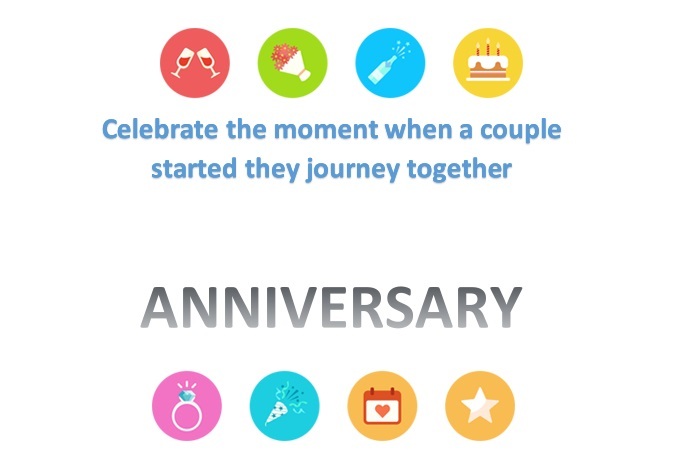 When a couple sims reach golden anniversary, they can throw an anniversary party, thus they can fulfill the "golden anniversary" lifetime want through this way. So, with this mod, there are two ways to achieve golden anniversray lifetime want. First is the game's way : when the couples are elder and have a good mood, and second is through achieving golden anniversary with this mod. 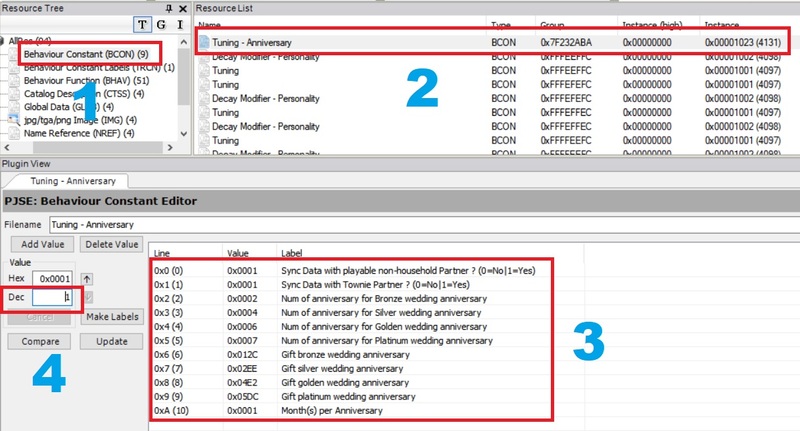 The couple sims will receive a custom memory on special anniversary (bronze, silver, gold or platinum) as shown in pic 2. If a sims has relationship before this mod is installed, after this mod is installed, this mod will give random relationship date as anniversary date for that sim, but the counter still starts from 0. Relationship check will only occur around midnight along with the season counter. So if your sim is divorce and married again with the same spouse on the same day, the relationship counter will not be reset. For those who also have Holidays mod, please also download plugin 01. And if you also have Holidays' plugin 00 (month length), please also download plugin 02 along with plugin 01. Please do not install plugin 01 if you do not have Holidays mod, and do not install plugin 02 if you do not have Holidays' plugin 00 (month length). For you guys with season length mod or age length mod, you may want to tune this mod as shown in pic 3, since this mod's setting is set to comply game's standard : 5 days per seasons or 5 days per quadrant and with default age length, so golden anniversary will only can be achieved when the sims is elder (or 30 days after they get married). OK, This mod is conflict with my holiday mod, but I provide the plugin to make it compatible. And also it is use the same STR# as Mood Swing+Midlife Crisis, so for you guys who has already localized the mood swing mod's STR# into your own language and game region's text, you should localize it again or you will get the english text again because this mod is override the STR#. 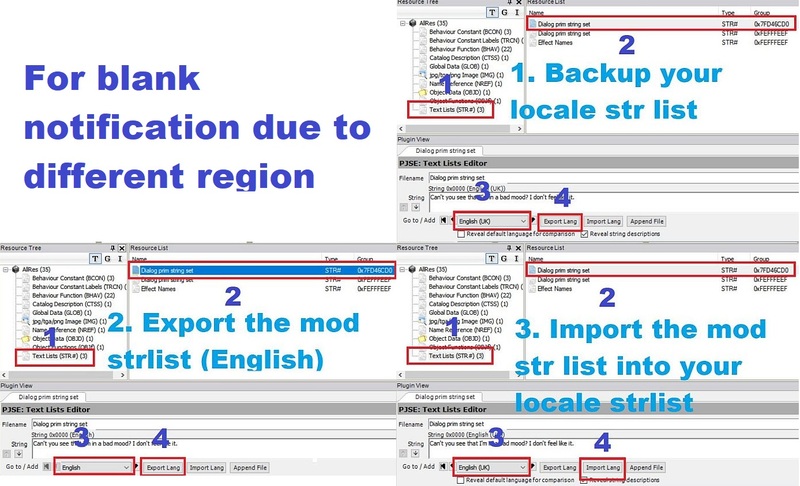 Just download this mod's "plugin 00 localization and blank fixed", open with SimPE and change the STR# as shown by pic 4. Just put my mod in Downloads folder of your sims 2 data. If this mod does not work, try to change the load order, like rename my mod to "z_pqw_t_anniversary.package". For inTeen user, please make sure this mod and all of its plugin, if any, are loaded after inTeen, by checking if there is "zzzz_" in front of original filename, and adding "zzzz_" if they have not been renamed yet. This mod must be load after "pqw_holiday.package", "pqw_mood_swing.package" and their plugins if any. If you do not change the name of those packages and this package, then it should be just fine, as it complies the load order. It is adviced for you to backup your nhood once in a while and before installing this mod just in case. 84 people have said thanks to piqiwi for this download.